Advertising and marketing agencies come in all shapes and sizes. Often, an organization in search of a new agency will be searching for a specific type of discipline within the agency they’re looking for. 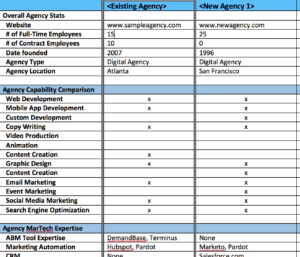 Below is a list of the most common types of agencies. A digital agency is a business that delivers marketing services and the creative and technical development of internet-based work products. A creative agency combines strategy, design, marketing, and digital services to create content that satisfies the problems, needs or goals of a client. While traditional advertising agencies often include many of the other services, they typically focus on Advertising and Strategy. A search engine optimization (SEO)agency helps organizations to affect the visibility of a website or a web page in a web search engine’s unpaid results. A public relations (PR) agency is focused on developing awareness via media, managing public image and more often than not developing content. A social media agency utilizes social networking websites as a marketing tool. They produce content and strategies that help broaden customer reach. A media buying and planning agency is focused on developing a media buying strategy and executing on the media purchases and subsequent tracking/analytics. This often is focused on both online and off-line media. A web design agency typically has many skills and disciplines to support the production and maintenance of websites. These skills include web graphic design; interface design; authoring, including standardized code and proprietary software; user experience design; and search engine optimization. A strategic marketing agency helps organizations better understand where, when and how to compete – aiding in the development of the overall marketing plan. A broadcast advertising agency supports the development of commercials aired on either television or radio, which are typically called spots. It’s also known as on-air advertising.